Dia De Los Muertos Sterling Silver Ring (process). Woo Hoo, it's hustle time for Dia De Los Muertos 2014! August is here and it only means that I need to get my act together for Dia De Los Muertos. There's so much to be done: the cookies, the altar, the dress, the flowers, the mole, ofrendas, the face-painting, and the bling too. I know, we are over two and a half months away, but the best way to do get ready, is to do a little bit of it at a time. As for the bling, I've been busy with all sorts of design ideas, patterns, samples, molds, etc. After some trials and many errors later, I came up with some new items which will be introduced in the weeks to come. Some previous were already listed on Facebook, Twitter, and Instagram, may be you saw them. This week I was able to do some damage with this ring which will be available as a custom order. It already has had a great response. Winkers are calling in with their ring size. If you would like to score one, your best bet is to place your custom order early, way early (by September) as this is my busiest time of the year and the calendar is already filling up with custom orders and events. Please see the Details, Custom Order Policy and the Wink Promise below. Price: $70 + Applicable Sales Tax and Shipping. Please send me a message to discuss your request. Timetable, supplies, sketches, and labor will be included on the project proposal. If custom order is agreed upon, it will require a full payment (via PayPal or Square) to start the project. If you prefer it, a private custom order listing on Etsy will be created for you to track the progress. Allow two weeks from full payment receipt for project completion and about 3-4 days for shipping. Rush custom orders available. Additional fees apply and start at $50. This fee may increase depending on the project. Allow one week for production plus 2-4 days for shipping. There will be absolutely no refunds or exchanges on custom orders. 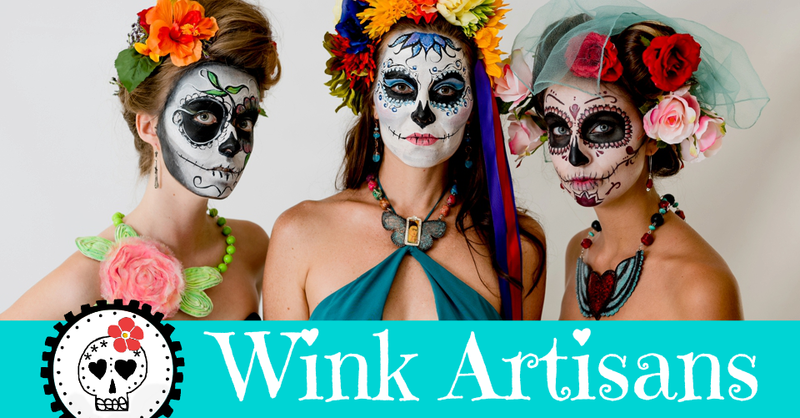 Every experience with Wink Artisans conveys uniqueness in jewelry design, the best possible quality, and the best warm and kind customer care. OK Winkers, it's time for me to bounce. You know where to find me if you need me. Until next time, keep on winking!